It’s a daily routine for many transit riders in the Seattle area: Pull out your smartphone, check the OneBusAway app, then decide whether you need to sprint to the bus stop or can afford that last sip of coffee. 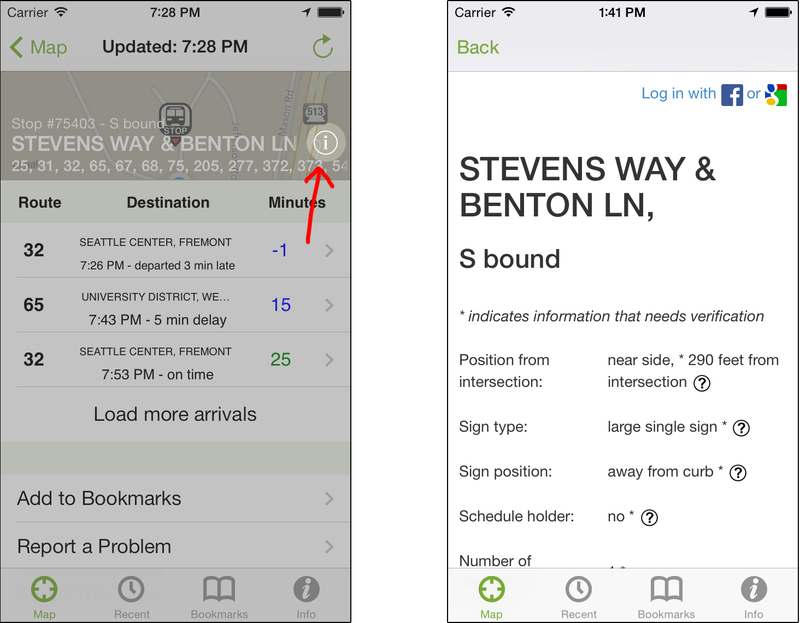 The application, developed at the University of Washington, uses real-time data to track when your bus is actually going to arrive. But for many blind and low-vision riders, knowing when the bus will arrive isn’t always enough. Crucial information like where the stop is in relation to the intersection and whether there is a shelter or bench sometimes can make the difference between an independent commute and a frustrating experience. UW computer scientists have created a program called StopInfo that integrates with OneBusAway and provides specific information on location, safety features and stop closures for each bus stop in King County. In particular, it seeks to collect and share information that blind people have identified as important when they ride the bus. It relies on bus riders using the OneBusAway application to update and provide information about each stop. “We’re interested in having OneBusAway be as useful for as many people as possible. In this case, we are looking at how we make it more user-friendly for blind and low-vision riders,” said Alan Borning, a UW professor of computer science and engineering who was involved in creating the original OneBusAway app. A team of UW graduate students and researchers, in collaboration with King County Metro, launched StopInfo last spring and has completed an initial study looking at its effectiveness for blind and low-vision users. The study and related paper, which will be presented and published at the Association for Computing Machinery’s Special Interest Group on Accessible Computing annual conference in October, found that StopInfo is generally helpful for blind riders and can promote spontaneous and unfamiliar travel. Its intent also is to offer more details about bus stops to all users, including when a stop is temporarily closed, researchers said. Each month, about 350,000 people in the Puget Sound area use OneBusAway, a free service launched in 2009. Two former UW doctoral students created the app with Borning, and last summer Sound Transit took over its operation. The real-time updating service also runs in Atlanta and Tampa, Florida. New York City, Washington, D.C., Detroit and other cities use variations of the service. In the OneBusAway app, users choose a stop, then click on the information icon at the top right. That takes the user to a StopInfo page about that stop. At the most basic level, each has information about the stop’s position from the intersection, sign type, and whether it has a schedule holder or a shelter. This data is provided by King County Metro and verified by users of the application. Users can also note other features of the stop such as lighting, seating and whether the bus sign is close to the curb. The system chooses which information to display for each stop according to a majority voting system by OneBusAway users. A field is considered verified when it receives 75 percent of the same vote by users, with a minimum of three votes. Some stops include comments added by users who sign in through a Google or Facebook account. This could be notes about uneven pavement or an unusual configuration for boarding the bus. In the initial StopInfo study, the research team asked six blind or low-vision participants to use the app for five weeks and record what features they liked as well as information about their bus trips, familiarity with routes and confidence while riding the bus. The team integrated feedback from the blind participants and now is seeking more participation among transit users to make the program robust on all routes in King County. “The success of this program depends in part on how fully the community participates,” said Caitlin Bonnar, a UW doctoral student in computer science and engineering. StopInfo is currently only part of the OneBusAway application for iPhones and related devices, but the researchers plan to expand it for use on Android and Windows phones. They initially deployed it on this platform because it’s the operating system most often used by blind and low-vision people and has a number of accessibility tools like VoiceOver already built in. The research team that also includes UW doctoral student Megan Campbell is now interviewing a broader stakeholder base – including bus drivers, orientation and mobility instructors and additional blind users – to make the app more useful for blind riders. They also plan to expand the app’s capabilities to help people with mobility impairments get better information about each stop. This research was funded by the National Science Foundation and the UW. For more information, contact the research team at stopinfo@onebusaway.org.